Visual recognition of previously visited places is a basic cognitive skill for a wide variety of living beings, including humans. This requires a method to extract relevant cues from visual input and successfully match them to memories of known locations, disregarding environmental variations such as lighting changes, viewer pose differences, moving objects and scene occlusion. Interest point correlation is a visual place recognition method inspired by results from neuroscience and psychology; specifically, it addresses those challenges by converting raw visual inputs to a low-variance representation, selecting regions-of-interest for representation matching, and identifying consistent matching trends. 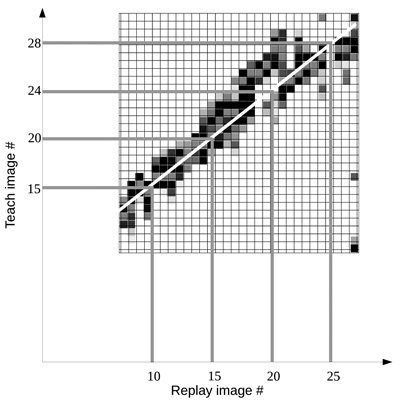 Real-world experiments employing a mobile robot demonstrate that interest point correlation is robust to visual changes, suggesting its founding principles are sound. H. Filho and A. Ohya, “Image Correspondence Based on Interest Point Correlation in Difference Streams: Method and Applications to Mobile Robot Localization,” J. Robot. Mechatron., Vol.28, No.2, pp. 234-241, 2016. E. H. Cornell, C. D. Heth, and D. M. Alberts, “Place recognition and way finding by children and adults,” Memory & Cognition, Vol.22, No.6, pp. 633-643, 1994. R. U. Muller and J. L. Kubie, “The effects of changes in the environment on the spatial firing of hippocampal complex-spike cells,” J. Neurosci., Vol.7, No.7, pp. 1951-1968, 1987. M. J. Milford and G. F. Wyeth, “SeqSLAM: Visual route-based navigation for sunny summer days and stormy winter nights,” 2012 IEEE Int. Conf. on Robotics and Automation (ICRA), pp. 1643-1649, 2012. R. L. Stewart, M. Mills, and H. Zhang, “Visual homing for a mobile robot using direction votes from flow vectors,” 2012 IEEE Conf. on Multisensor Fusion and Integration for Intelligent Systems (MFI), pp. 413-418, 2012. K. Kurashiki, M. Aguilar, and S. Soontornvanichkit, “Visual Navigation of a Wheeled Mobile Robot Using Front Image in Semi-Structured Environment,” J. of Robotics and Mechatronics, Vol.27, No.4, pp. 392-400, 2015. S. Lynen, M. Bosse, P. Furgale, and R. Siegwart, “Placeless place-recognition,” 2014 2nd Int. Conf. on 3D Vision (3DV), Vol.1, pp. 303-310, 2014. D. Gálvez-López and J. D. Tardos, “Bags of binary words for fast place recognition in image sequences,” IEEE Trans. on Robotics, Vol.28, No.5, pp. 1188-1197, 2012. K. Tanaka, Y. Chokushi, and M. Ando, “Mining Visual Phrases for Visual Robot Localization,” J. of Advanced Computational Intelligence and Intelligent Informatics, Vol.20, No.1, pp. 57-65, 2015. E. I. Moser, E. Kropff, and M.-B. Moser, “Place cells, grid cells, and the brain's spatial representation system,” Annu. Rev. Neurosci., Vol.31, pp. 69-89, 2008. B. Goertzel, R. Lian, I. Arel, H. De Garis, and S. Chen, “A world survey of artificial brain projects, Part II: Biologically inspired cognitive architectures,” Neurocomputing, Vol.74, No.1, pp. 30-49, 2010. T. Fujita and C. M. Privitera, “Positional Features and Algorithmic Predictability of Visual Regions-of-Interest in Robot Hand Movement,” J. of Robotics and Mechatronics, Vol.21, No.6, pp. 765-772, 2009. B. B. Murdock Jr., “Convolution and correlation in perception and memory,” Perspectives on Learning and Memory, pp. 105-119, 2014. A. Baddeley and G. J. Hitch, “Working memory,” Scholarpedia, Vol.5, No.2, p. 3015, 2010 (revision #91945). H. Perroni Filho and A. Ohya, “Mobile Robot Path Drift Estimation Using Visual Streams,” 2014 IEEE/SICE Int. Symposium on System Integration, pp. 192-197, 2014. D. Burschka and G. Hager, “Vision-based control of mobile robots,” Proc. of 2001 IEEE Int. Conf. on Robotics and Automation (ICRA), Vol.2, pp. 1707-1713, 2001. R. Bajcsy, “Active perception,” Proc. of the IEEE, Vol.76, No.8, pp. 966-1005, 1988. M. A. Fischler and R. C. Bolles, “Random sample consensus: a paradigm for model fitting with applications to image analysis and automated cartography,” Communications of the ACM, Vol.24, No.6, pp. 381-395, 1981. D. J. Parkhurst and E. Niebur, “Scene content selected by active vision,” Spatial vision, Vol.16, No.2, pp. 125-154, 2003. H. Roger and R. J. Charles, “Topics in matrix analysis,” Cambridge University Press, 1994. S. T. Dumais, “Latent semantic analysis,” Annual review of information science and technology, Vol.8, No.1, pp. 188-230, 2004.